The winning student design competition entries from Benjamin Moore and the ASID Foundation‘s recent scholarship contest. Rendering by Tess Messina, courtesy of Benjamin Moore. 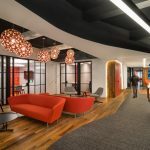 Benjamin Moore, in partnership with the ASID Foundation, recently held its Workplace of the Future student design competition for interior design students (we were proud to be a judge!). Entrants were challenged to submit renderings of a design solution that envisions what a workplace will look like in 5-10 years, incorporating the following key design elements: modular and adaptable workspaces, eco-friendly materials, technology driven environments, and promotion of employee wellness. Rendering by Emily Messina, courtesy of Benjamin Moore. Rendering by Heather Sutherland, courtesy of Benjamin Moore. Last but not least, Heather Sutherland — a graduate student in her final year that The University of Texas at Austin — focused her concept on personality-based design and functionality. According to Sutherland, offices should be “a place that allows workers of all activity levels, work types, and extroversion levels to find a place to get work done.” For this entry, she separated the space in to three work zones: the Co-Lab, the Social Hub, and the Library. “Each zone uses different lighting, materials, and acoustics to achieve the optimum level of work,” she said. Congratulations to the three winners and thanks again to Benjamin Moore and the ASID Foundation for having us on as a judge! Three fantastic ideas in your competition and thoroughly deserved winners. We particularly liked the idea of designing an office space that helps to restore imagination and how it is shaping itself for the future by encouraging collaboration through technology.